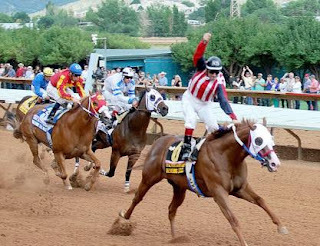 Track: Ruidoso Downs, New Mexico. When: Labor Day, Monday September 3rd. What: The World's Richest Quarter Horse Race, The Grade I $2.4 Million All American Futurity. Who Won: One Dashing Eagle ridden by Ramon Sanchez, Trained by Jose De La Torre, Owned by Jose and Gustavo De La Torre and San Gregorio Racing Stables Inc.
Not only is winning the All American Futurity a difficult task, just qualifying as one of the final 10 horses in the gate on Labor Day is a mission in itself. One Dashing Eagle was one of the 257 horses that raced in the 26 trials (the ten runners with the fastest final times earn a spot in the final) a few weeks back in search of a fast enough time to be in the top ten. One Dashing Eagle won his trial in a time of 21.369 for the 440 yards. That was a good enough time to land the sixth fastest qualifying time. In his trial One Dashing Eagle won despite lugging out to the outside rail during the running of the race. I believe that was a good thing. Why? Because after that race, his Jockey Ramon Sanchez knew what he had to correct and worry about in the final on Labor Day. One Dashing Eagle (at Odds of 6-1, paid $14.60 for every $2 to win) broke good in the All American Futurity from post position #6 and from the start you could see that Jockey Ramon Sanchez was just trying to keep him straight and not ask him much to not lose his rhythm. He kept extending his stride and had a good lead midway through the race and pulled away to a 1 and 3/4 length win in a final time of 21.23 seconds. Sudden Thoughts got second, Aha Moment finished third. One Dashing Eagle earned $1,200,000 for his win in the All American Futurity. He now has two GI wins under his belt, previously had won the GI Ed Burke Million Futurity at Los Alamitos Race Course, and his lifetime earnings are now $1,626,205. He was purchased for $43,000 at the Ruidoso Select Yearling Sale, talk about return on investment! Next, he will likely be pointed to the Golden State Million Futurity. Sadly he is not paid in The Two Million Futurity, both of those races are to be run later this year at Los Alamitos Race Course. If you follow my blog and follow me on twitter you knew that One Dashing Eagle was my pick all along leading up to the race, hope i helped you cash a winning wager.